We are currently recruiting for a Clinical Negligence/Serious Injury Solicitor for our clients firm based in Preston. Our client is looking to expand in this area therefore they require someone who has wealth of technical experience and is assist with the marketing and train staff if required. 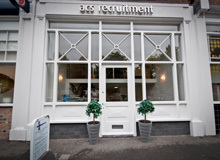 We were Liverpool’s first independent employment agency and have long been a trusted and well respected establishment. Locating work for over 1,500 people and employing over 3,000 temporary staff each year we put our success and longevity down to the whole team putting quality and service above all else.